Temperate waters can provide excellent diving, but because the water is cold for most of the year, it’s best to use a drysuit. Wrapped up well to avoid getting cold, divers can often enjoy excellent short-range visibility even if the water is green. The seas around a lot of coasts are subject to tidal ranges that can be quite marked in the difference between high and low water. This means that dives have to be planned using local tide tables. Divers enter the water and conduct the dive at the optimum time, usually in the interval between the changing tides. This is called the ‘slack’ water. Careful planning is very important. Often, it is necessary to wait a while until the time is right for a successful dive. This time is used to discuss the dive and to make sure that everyone understands and will stick to the agreed dive plan. Slack water only lasts 20 minutes or less, and because the water is usually still moving slightly, divers can easily get separated in the first moments of a dive. There are only three periods of slack water in any 24 hours, and some of these can be at night. It is important that the dive is not interrupted by incorrectly rigged gear or some other problem, so performing buddy checks immediately before entering the water is essential. Long-range visibility can be very limited at depth, and it can be variable. Plankton blooms in summer can reduce the range of visibility to less than 1 m (3 feet) at times. A reliable diving light is an essential piece of equipment that allows each diver to know where the other is. It is impossible for people in the boat to know where the divers are, so unless the dive is around a fixed position, such as that provided by a buoyed wreck, one diver of a buddy pair takes a surface marker buoy. It is deployed on its line from a reel according to the depth of water. The buddy makes sure to stay with the diver holding the reel. In that way, the divers may cover a large area of the seabed during a dive, drifting along effortlessly with the current. Good temperate water diving is found in many places. Around the coast of the United Kingdom, the western reaches of the English Channel, littered with war wrecks and accessed from Devon and Cornwall, the coast of Wales, and the Western Isles of Scotland offer great diving. Other famous areas that offer excellent temperate water diving are Norway, the coast of Vancouver Island, Canada, including the Inner Passage, and the Poor Knights marine reserve in New Zealand. Because diving in temperate conditions is less popular than in the warm waters of the tropics, divers need to be more self-sufficient. They can often find themselves diving where there are no other divers. 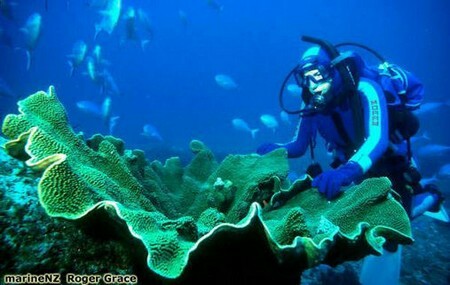 Diving in locations where there are no formal dive centres can mean that dive trips take on the format of an expedition. This appeals to ready-made groups of divers, such as dive clubs, and the friendship and camaraderie that develop between the participants give these expeditions a special character.